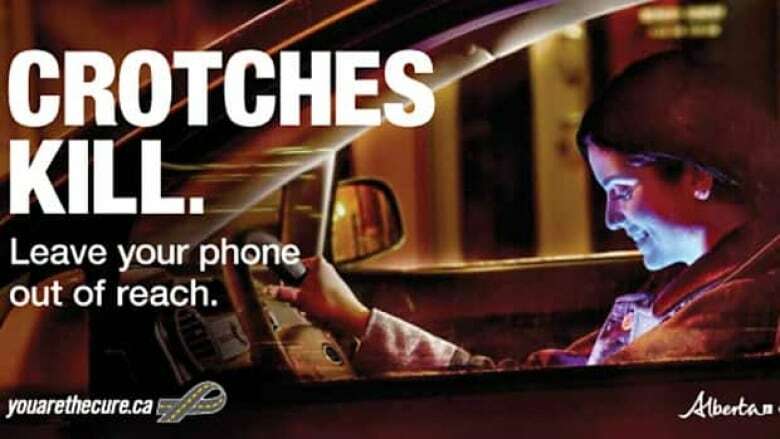 An edgy new campaign aimed at distracted drivers is being rolled out across Alberta called "Crotches Kill." The idea is to remind drivers to keep their eyes on the road and not on the phones in their lap. "Because every text you send from your lap takes your eyes off the road for five seconds — enough to do a lifetime of damage," the ad states. The $380,000 campaign is rolling out on radio, billboards, posters and online in two phases. The first wave calls attention to drivers who attempt to hide texting by taking their eyes off the road and staring "down there," according to the province. "Our goal is to get their attention, and to ultimately save lives, and the way to do that was to come up with a campaign that spoke to them and generated conversation," said Donna Babchishin of Alberta Transportation. The second phase asks people to think about how long a text message takes to send, and the dangers that come with it. "The campaign is in part targeted at a very young demographic," said Babchishin. "The highest rate of convictions for distracted driving are actually 25 to 34-year-old males." One ad even includes a talking urinal puck. "Distracted by your crotch again, huh?" says the urinal puck. "Well, it’s fine to do it here, but it can kill behind the wheel. Keep your eyes up. Don’t text and drive. We know what you’re doing down there." Alberta’s distracted driving legislation has been in effect for 15 months. The province says there were about 19,000 distracted driving convictions in the law’s first year, and 95 per cent of those involved hand-held devices. It's not the first time Alberta has launched a cheeky campaign in hopes of changing public behaviour. In 2011, the province launched an online syphilis awareness campaign, plentyofsyph.com, that parodied an internet dating site. The ad was hailed as a success by many in the advertising industry.